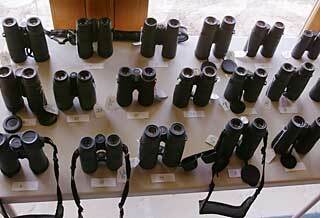 What is the best birding binocular in the world? If a birder were ready to break into the piggy bank, what could he or she get? Are there clear differences at the top? We asked optical manufactures to send us their top birding binoculars so we could compare them against each other. We ended up testing 31 high-end binoculars, from 14 manufacturers, with street prices ranging from $750 to $2095. Although not all birders can afford this costly a binocular, there's probably no birder who wouldn't like to have one. We tagged and numbered each binocular and set them up on tables overlooking a scene that included flower beds, lawn, bird feeders, trees, and a wild field that sloped down to a country pond. A smorgasbord of viewing pleasure, both near and far. We put a well-lighted optical resolution chart on the wall across the room from a beanbag-topped tripod, so that any two binoculars could be set side by side and their rock-steady images carefully compared. There were also miles of birding trails right outside our door, and we could pick up any binocular we wanted to take out for a thorough field test. We lived with this setup for over a month. 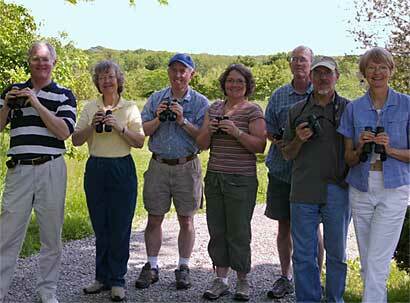 In addition to our own extensive testing, we invited a team of local Iowa birders in for a test day so they could also judge the binoculars. This article sums up the results of the comparisons, and a chart shows the judges' scores. But first a caveat about the image quality scores on the Ratings Chart. All the high-end binoculars have superb optical quality. In fact they're so good that readers should take the image quality scores with a grain of salt. Although it would be a mistake to say there are no differences, the differences grow increasingly subtle as you approach the top. Reasonable, intelligent people could differ about which one was best. Every binocular provided excellent resolution, brightness, contrast, freedom from chromatic aberration, and color fidelity. Such is to be expected, considering the enormous effort of optical research and development that these objects embody. The good news it that it's difficult to make a bad choice among the highest-rated of these binoculars. However, you probably shouldn't decide on the basis of a small difference in the image quality scores. The judges did not agree perfectly on the image quality rankings. If you had been there to compare the binoculars yourself, your ranking might not have been quite the same as the composite scores shown in the chart. Among binoculars of such high optical quality, other features will likely determine which binocular will bring you the greatest satisfaction. Here are some important variables in the equation of a satisfying binocular experience. 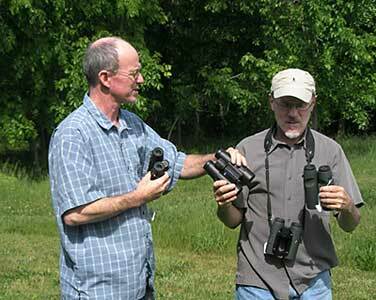 A binocular should fit your hands and eyes and be appropriate to your use. These are individual considerations. What seems heavy to one person might seem light to another. A wide field of view gives an impressive, big-picture image. Wider images (like you see with High Definition TV) provide more immersive experiences and are more likely to wow. And of course a wider field of view makes it easier to spot the bird. If you wear glasses, long eye relief is critical. Otherwise, instead of sitting in the stadium, you're watching the game through a hole in the fence. Close focus matters more to some birders than to others. A birder whose main interest is hawk watching probably won't care much about close focus. But if you enjoy watching butterflies and hummingbirds, then it will be a big issue for you. The Ratings Chart summarizes our findings in a numerical way, with the highest scorers at the top of each category. This article appears as part of the High-end Binoculars Round Up in the September, 2008, issue of Bird Watcher's Digest. Text and photos copyright 2008 by Michael and Diane Porter.